Story by Nathan Adlen at TFLtruck: Nissan invited The Fast Lane Truck to see their first (official) crack at an overlanding truck – the Nissan Titan XD Pro-4X Project Basecamp. For years, off-road vehicles have been extensively modified for extended, rugged excursions. While it’s not a prerequisite for overlanding (you can do it with a moped and a tent) having a beefy, diesel truck is a smart beginning. This adventure drive coincides with the 2017 Overland Expo, where Nissan’s overlander trucks was on display May 12-14th in Flagstaff, Arizona. We spent a whole day driving in or with the Nissan Titan XD Pro-4X Project Basecamp driving into the Grand Canyon, stopping at the shore of the Colorado River. Along with the Nissan Titan XD Hellwig “Rule Breaker”, which debuted at the 2016 SEMA show, the Nissan Titan XD Pro-4X Project Basecamp points at a promising first step into overlanding for the brand. Extended range, respectable economy and great torque make diesel trucks appealing for overlanding. They are known to be rugged and reliable too. Still, the Big-3’s heavy-duty diesels are pricy and can be ponderous for some drivers. Having something that splits the differences between their heavy-duty trucks and light-duty, 1/2 ton trucks may be the Nissan Titan XD diesel’s best attribute. Nissan started with a Titan XD Pro-4X with the 310 horsepower, 555 lb-ft of torque, 5.0-liter diesel engine. Hooked up to a six-speed Aisin transmission, the Nissan Titan XD Pro-4X has an electric locking rear differential and tows 11,790 lbs. Being a heavier diesel, it’s rated at 1,744 lbs payload. It’s a respectable start, but there’s already a catch: the aforementioned Nissan Titan XD Hellwig Rule Breaker holds a 2,000 lbs Lance camper. That’s way over the standard payload maximum. Fortunately, both the Nissan Titan XD Hellwig Rule Breaker and the the Nissan Titan XD Pro-4X Project Basecamp have numerous suspension enhancements from Hellwig. As such, not only are extra loads workable, both vehicles performed on hard terrain as well as our unmodified (and unburdened) Titan Pro-4X 1/2 ton trucks. Seeing the Nissan Titan XD Pro-4X Project Basecamp function off-road while it pulls a trailer, in the rough, was like watching a military vehicle at work. I noticed very little sway on either vehicle off-road (mostly washboard and rocky riverbed) and they certainly looked at home when we made camp. 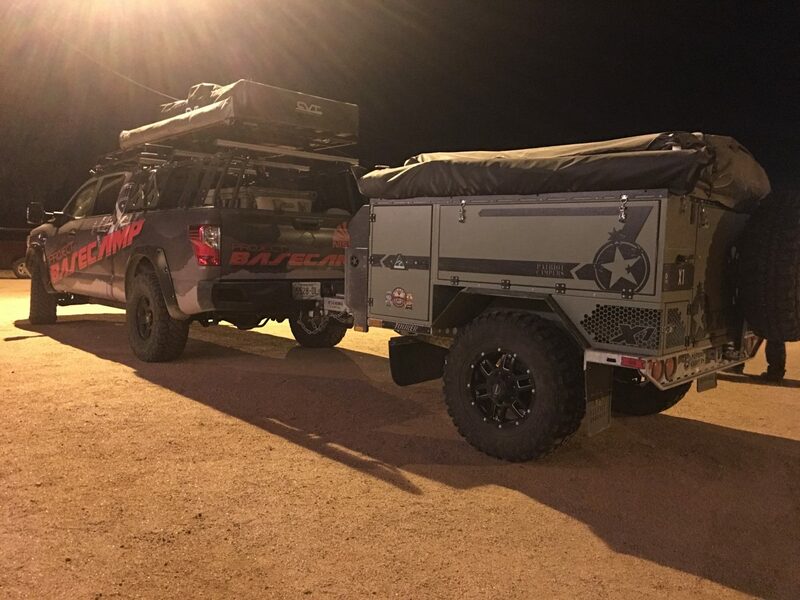 The Patriot X2 adventure trailer weighs about 2,600 lbs and was an outstanding resource on the trail. We used its kitchen and cargo holds to feed over a dozen hungry adventurers. It rarely bounced (unlike other adventure trailers we’ve worked with) and it simply looks awesome. The accessory list for the Nissan Titan XD Pro-4X Project Basecamp is extensive, but you can purchase these components and pretty much build one of your own.